Clarity and focus are important qualities for success. But what if you’re feeling uncertain and don’t have a lot of clarity about your future direction? What if you can’t decide what is next? This is a common problem, fortunately there are many actions you can take and mental adjustments you can make that will help you shift from uncertainty to certainty. It’s not going to happen unless you make it happen. Many people assume that clarity is something that will arrive in good time if they simply wait patiently. Some people get lucky; others don’t. These attitudes are pointless and self-defeating. Clarity is what you create for yourself. Clarity is a decision. To make a decision, you must cut away other potential directions. If you remain open to lots of different directions at the same time, you get confusion and fuzziness. When you commit yourself to one specific direction, clarity is the natural result. Now it’s entirely possible that you may not be very good at creating clarity yet. Realise and accept that if your current degree of clarity is to improve, then you must actively make some changes. Endless pondering why you don’t have clarity will only perpetuate confusion, so that’s a bad habit you can drop immediately. Stop creating the opposite of clarity. If you want to experience more clarity, you must avoid any thoughts or actions which result in the opposite effect. If you find yourself surrounded by people and circumstances that leave you feeling and confused, drop those elements from your life, and give yourself the space to create and enjoy the clarity you seek. Harvest and apply the clarity lessons from your past. 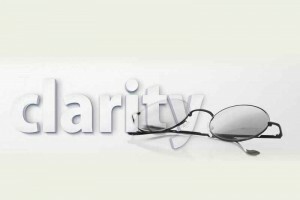 Notice that your level of clarity isn’t the same at all times. At some points in your life, you’ve been very clear. At other times you’ve been extremely uncertain. Take a moment to review those times when you’ve been at one extreme vs. the other. See if you can identify some of the causal factors on both sides. Notice which factors lead to reduced clarity, and do less of them. Also notice which factors lead to increased clarity, and do more of them. This sounds simple, and it is, but chances are that you aren’t applying this idea as well as you could. Use visualisation to create the vibe of clarity. Either you feel clear and focused right now, or you don’t. state of being to experience. Sit quietly for a few moments and imagine what your surroundings would look like if you were really clear about your direction in life right now. Imagine the people and circumstances that would be in your reality. Imagine how you’d dress, how you’d move, and how you’d communicate with others. Paint a vivid picture of a reality – any reality – in which you feel crystal clear about your direction in life. Do this for at least 10-20 minutes per day until the clarity vibe feels normal and natural to you. The more you practice holding this vibe, the more clarity you’ll bring to the rest of your life and to all the decisions you make. Help is available when you need it, so take advantage of it. Ask someone who’s clear about their path to assist you. The quality of help you receive will vary depending on the source. For example, an experienced practice coach may be able to help you gain clarity quickly, while an enthusiastic but inexperienced friend may create more confusion than certainty. Also, consulting with an unbiased outsider is usually more beneficial than asking for help from someone who’s personally invested in your situation. Put your goals in writing, and review them daily. This is a well-known habit of success, yet its practice remains inconsistent for most people. As soon as you write down your goals, you’ll experience a boost in clarity. And each time you review your goals, you’ll gain more clarity. Jack Canfield recommends the practice of writing your goals on index cards, one goal per card. Then flip through the cards and imagine each goal as real when you first wake up in the morning and again before you go to bed. This is an excellent habit to install. Accept that any goal is better than no goal. Don’t pressure yourself into trying to come up with the perfect list of goals. You’ll never get there. Just write down some items that appeal to you, such as new experiences you’d like to have. Start with the goals that are easy for you to desire. Is there someplace you’d like to visit? Some activity you’d like to try? Someone you’d like to meet? As you get into the habit of setting and achieving goals, better goals will come to you. Don’t worry so much about changing the world if you’re still new to goal setting. Focus on some appealing but smaller achievements first, and as you get good at achieving those goals, continue to expand your goals in new directions. As you review your goals, try to lock them down and make them more specific. For example, instead of asking for a job you enjoy, you could say, “I make a living helping people through providing healthcare treatments” That’s a positive step towards greater specificity. Then as you think about that goal, you may progress to, “I enthusiastically earn $100,000 per year adjusting, treating, assessing people in my community while offering an open ear for their problems.” That goal is much clearer still. Clear written goals help you stay focused. Fuzzy goals leave you feeling uncertain. Pay attention to the path, not just the end result. Sometimes the way you achieve a particular goal is more important than the goal itself. When a goal is too straightforward, it can become demotivating because the action steps may get tedious and repetitive after a while. But if you can spice up the process used to achieve the goal, you may discover some newfound excitement. Sometimes it’s fun to take the scenic route. Stick with one primary goal at a time. If you have a lot of goals, it’s easy to fall into the trap of jumping around between different goals and making little progress on any of them. If you want to actually achieve a goal, focus on one key goal single-mindedly until it’s achieved. Then move on to another goal. Or if you have a really big goal to achieve, create sub goals and move from one sub goal to the next. This is what top achievers do. Having too many competing goals will simply scatter your energies. When you look back on the previous year, do you see a track record of massive progress toward your primary goal? If you aren’t satisfied with your current rate of progress, then you’ll need to make some changes to avoid repeating the same pattern next year. There’s no honour in having a big goal on your list if you aren’t making serious progress towards its achievement. Don’t delude yourself into thinking that setting a big goal is the same thing as achieving a big goal. Sometimes it’s tough to set a clear goal because you don’t know what you’re getting into. In that case you can experiment in order to gain clarity about the goal space you’re exploring. Doing what you’re already doing won’t give you more clarity. Thinking about what to do next and writing down some goals can certainly help, but that isn’t always enough. Sometimes you have to get moving first before clarity can be achieved. You’ll enjoy more clarity when you’re in motion than when you’re standing still. A pilot has better visibility from the air than from the ground. Don’t wait for clarity to come to you. You’re responsible for creating your own clarity from within. If you lack clarity, then get busy creating it. If you can achieve clarity by doing written exercises from the comfort of your home, great. If not, then leave your comfort zone behind, go outside, and explore what’s out there!